Thank you for your interest in Alaska Arctic Turtle Tours. We offer four tours in the Arctic and the Interior Alaska and can customize your trip, if you desire. We are open year-round to accommodate all visitors wishing to explore Interior and Arctic Alaska. During the summer, most mountain ranges still carry snow on their peaks, yet wildflowers cover the landscape. 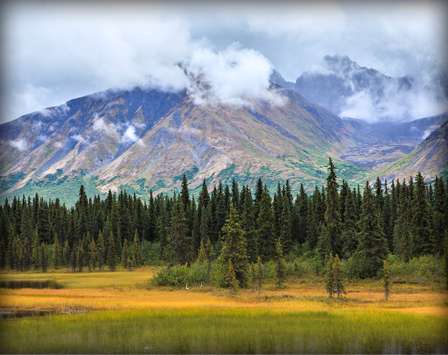 During August, the tundra turns to brilliant reds, while the leaves change to bright yellow. Winter is the biggest secret in Alaska, with it’s winter wonderland and northern lights. We cater to small groups of two travelers or more, so you will receive individualized attention throughout your travels. Your trip will be made in comfort of one of your luxury 15-passenger vans. Wildlife is seen on 92% of our trips. One of our popular tours is a one-day tour excursion to the Arctic Circle. On this tour, you will drive through miles of Arctic Tundra, its an memory you will always cherish. Mention our website when making a booking to receive a considerable discount on applicable tours!